I recently had to bring my dog to the vet for what seemed to be a skin condition. 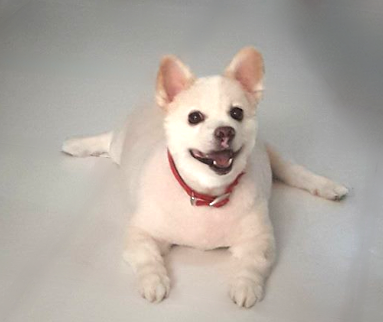 I took my dog grooming on Saturday and all was well with the groomer being able to handle him without even having to put a muzzle on him, which was rare since my dog's pretty defensive when being groomed. He had a nice cut and looked like a baby seal. Two days later, I noticed two little spots (about a half inch) on his body which seemed to be just irritated skin. I gave him a bath thinking his skin must have gotten irritated somewhere. It didn't look bad, just a little pink. On the third day, both spots had wounds, now they had some sort of liquid coming out of them. I cleaned the two areas with Hydrogen Peroxide (not a good idea - it was obviously painful - read on) and Betadine. 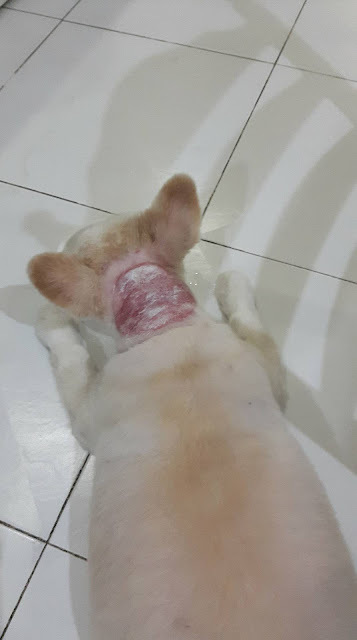 On the fourth day, I came home from work to find that the hair on top of the wounds have hardened by some liquid and I gave him another bath to wash it off. I noticed it was getting redder. After searching, I found that it was really not a good idea to put hydrogen peroxide as it can delay the healing process. I still put Betadine to clean the wound because I didn't want it to get infected. On the fifth day, I came home from work to find that it had gotten bigger around 2-3 inches radius. I saw he was wiping his body on doormats to scratch his back which could explain why it was getting bigger. I removed all the doormats to avoid him wiping dirt on his wounds and once again gave him a bath to make sure he's clean and the wounds don't get infected. On the sixth day, I came home from work to find the wounds have more than doubled in size, was leaking some sort of liquid and was obviously showing open skin. I took him to the vet immediately. When we reached the vet, they shaved it to remove all hair blocking the wound. 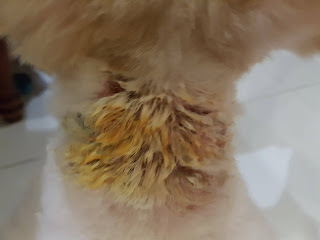 The doctor had cleaned it with water and Betadine and put a cream called Vetnoderm. 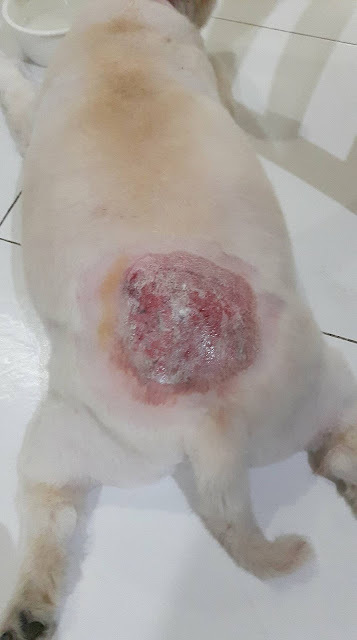 A week before, my dog was completely fine, and now the below photos will show the aftermath of nothing more than hot spots. Warning: The next images will be quite gruesome. We currently reside in the Philippines where Summer is hell. These hot spots apparently are very common especially in this time of year because of warm temperatures which could add to the cause. My dog is turning 12 this year and has never had this problem until recently. 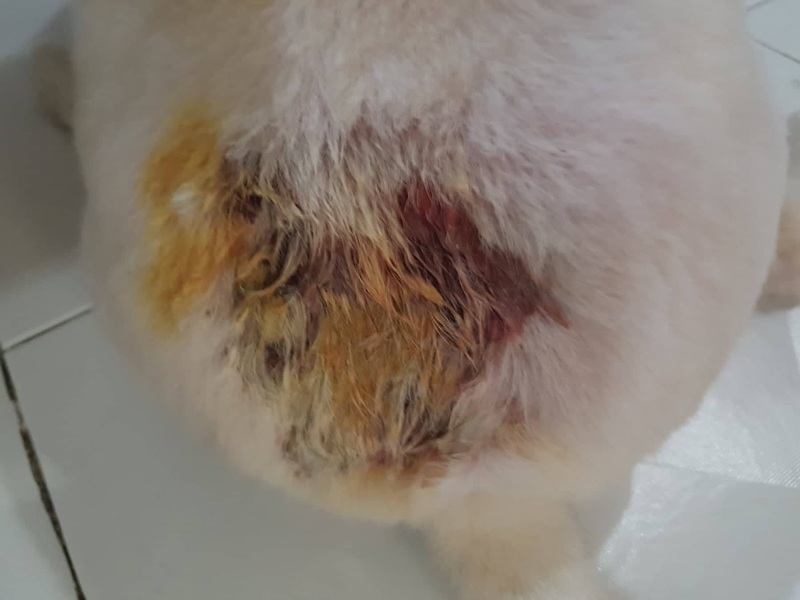 The vet can only assume that the razor used to shave him by the groomer was not clean and handed the bacteria onto my dog, irritating his skin and causing this. I can't fathom how painful this must be for him and I hope it goes away immediately. * Ask your groomers to sanitize their tools before using it on your dogs. * Make sure you bring your dogs to the vet immediately after seeing any sort of irritation on their skin. This thing appeared out of nowhere and grew alarmingly in such a short period of time. My dog's wounds dried up on the first week. I continued using Vetnoderm until there was no trace of his wounds left. His hair started growing on the area where the wounds were after about 3-4 weeks. He is now completely healed and is a happy pup. Keep your pups safe and enjoy the weekend!